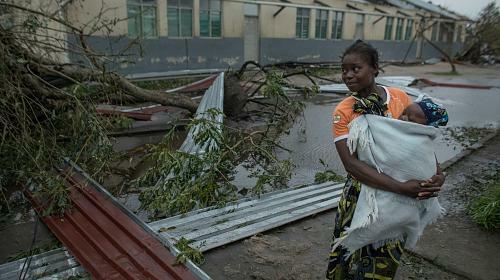 CAFOD is appealing for help as it seeks to provide urgent humanitarian for the millions of people made homeless by Cyclone Idai. The charity says its priority is to reach the most vulnerable with food and clean water, basic shelter and hygiene kits in Mozambique, Zimbabwe and Malawi. The scale of the crisis is such that the Disaster Emergency Committee, of which CAFOD is a member, has launched a full-scale humanitarian appeal. “The more we see and hear of the destruction caused, the more shocking the impact on the lives of children, women and men,” said CAFOD director Christine Allen. “We know the Catholic community will want to respond. The Church and our local experts in southern Africa are already responding but desperately need your support. Gabriele, a CAFOD expert working with the Church in Mozambique, says: “Idai has wiped out crops and livestock, damaged water supplies and wrecked sanitation facilities, leaving vulnerable families even more exposed. CAFOD is asking people to pray for those affected and is also hoping parishes will hold a special second collection. Donations will provide food, clean water and healthcare to people in desperate need. The charity thanked those who supported its Family Fast Day, which it relies on for projects over the next year around the world. To read more about the Cyclone Idai appeal and make a donation, visit cafod.org.uk/cycloneidai.